This story in the New York Times about the selling of 5-star reviews, and the importance of reviews in getting your book noticed, read and purchased, is interesting and tells us something about how e-publishing is changing the fundamentals of book publishing. I argued in my last post that a few bad reviews to balance out the good will lend credence to your reviews overall. But one individual in the article argues that he pays attention only to the bad reviews, since he assumes all the good ones are fake. Which leaves the poor author where? Stuck between a rock and a hard place, as usual. So -- would you ever pay someone for a good review? Would you pay someone for any kind of review? I've gotten a couple of so-so reviews over the last few weeks (along with a couple of nice ones) and while my initial reaction to these affronts was a rich mixture of crap and harrumph, I quickly came to realize these were blessings in disguise. 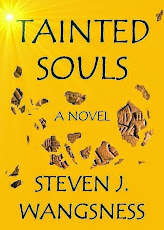 If nothing else, a two-star rating (at Goodreads) and a three-star rating (at Barnes and Noble) lend credence to all the four- and five-star ratings left by other readers of Tainted Souls on those sites and, where applicable, the nice things they had to say in their reviews of the book. Considering the lengths to which some writers go to get every relative, friend, neighbor or passerby to write a sterling review of their opus, the presence of a couple of clunkers here and there ought to give some testimony that the other reviews are also real, even the somewhat goofy five-star review at B&N that reads, "I real like reading this book." After all, you can't please everyone. Do you agree? Or do you still just cringe when someone gives your baby as less-than-perfect score?